"The variable star R Coronae Borealis is a jewel worthy of a place in any crown. It is one of the most interesting and most peculiar of all variables, and is often called the 'ideal' irregular variable. Its times of minima are distributed absolutely at random, according to the laws of pure chance" (Margaret Mayall, The Review of Popular Astronomy, May/June 1962, p33). R Coronae Borealis (R CrB) has been a favorite with observers ever since its discovery nearly 200 years ago by the English amateur, Edward Pigott. Located inside the bright circlet of stars that form the Northern Crown, R CrB is usually easy to find with binoculars or even the unaided eye at 6th magnitude. "We caught this star smoking," says Helen Walker of the Rutherford Appleton Laboratory in England, who was in charge of the observation. "The amateurs saw the star fade from view in visible light in October, but it remained bright in the infrared. The telltale wavelengths revealed sooty carbon compounds newly formed in the star's vicinity. Without ISO [and amateur astronomers] we could not hope to analyse such a striking event." R CrB is currently recovering from a period of fadings that started in August of 1999. The AAVSO encourages observers to monitor this elusive star and report their observations to headquarters. For more information on submitting observations, visit our Observer's page. 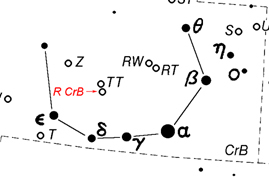 R Coronae Borealis is the prototype star of the R Coronae Borealis (RCB) type variables. These hydrogen-deficient and carbon-rich F or G supergiants go into "outburst" not by brightening like other variables, but by fading! R CrB spends most of its time at maximum around magnitude 6, and at irregular intervals it experiences deep declines of up to 8 magnitudes. The decline is sharp. It may drop several magnitudes in a few weeks. The star may remain faint for an extended period of time or have several recoveries and declines in succession. Often the final rise back to maximum light is slow, taking several months to a year. Right now the AAVSO has a copy of the R Coronae Borealis monograph on sale for you. The Monograph contains a light curve of R CrB from 1843 to 1990, and with your monograph order, you will receive a free supplement that updates the light curve to 1995. To obtain a copy of the R Coronae Borealis light curve from 1843 until 1995, visit our online store. This year  marks the bicentennial of the discovery of the variability of R Coronae Borealis. The R Coronae Borealis (RCB) stars are distinguished from other hydrogen-deficient objects by their spectacular dust-formation episodes. They may decline by up to 8 magnitudes in a few weeks, revealing a rich emission-line spectrum. Their atmospheres have unusual abundances with very little hydrogen and an overabundance of carbon and nitrogen. The RCB stars are thought to be the product of a final helium shell flash or the coalescence of a binary white-dwarf system. Dust may form in non-equilibrium conditions created behind shocks caused by pulsations in the atmospheres of these stars. The RCB stars are interesting and important, first because they represent a rare, or short-lived stage of stellar evolution, and second because these stars regularly produce large amounts of dust so they are laboratories for the study of dust formation and evolution. R Coronae Borealis stars stay at maximum and then intermittently experience fluctuating minima because carbon-rich dust clouds periodically obscure the photosphere of the star. R Coronae Borealis, when exposed, is a star that usually shines around 6th magnitude, and it is during this time that the star is at "maximum". At highly irregular time intervals that are unpredictable as of yet, the star enters a deep minimum. The minimum is caused by a dust cloud of amorphous carbon (extinction curves have confirmed that the dust causing the decline is carbon-rich), which eclipses the photosphere of R CrB, preventing an observer from seeing the entirety of the star's luminosity. Each successive drop in brightness within a decline is caused by new dust formation. These episodes of dust formation seem to occur on successive pulsational cycles of the star, although this is hard to prove. There are different explanations of the formation and evolution of the dust clouds and it is not quite predictable yet when, why, or how they form. Eventually, the dust cloud moves out of the way, re-exposing the photosphere of the star as it returns to "maximum". One theory that explains the formation of dust clouds around RCB type stars has been called the Orbiting Dust Cloud Theory. This model, as explained in Geoffrey C. Clayton's Invited Review Paper "The R Coronae Borealis Stars", PASP, 108, 1996 March, proposes that clouds of dust orbit the RCB star and periodically pass along the line of sight of the star, obscuring its photosphere. This model, however, has trouble fitting the observational data. The passage of a dust cloud across the star is not consistent with the structure of the decline light curve or with evidence of dust-grain evolution. So dust ejection from a secondary star in a binary system must be invoked to make this model viable, however, there is no evidence of binarity in RCB stars. A second, more likely model explained in the same article by Geoffrey C. Clayton involves dust forming from material lost from the RCB star itself. Mass is lost from the RCB star and then moves away from the star until it reaches the condensation temperature of carbon dust (at about 20 stellar radii). Once the carbon dust has formed, the photosphere of the star is eclipsed, the star goes into minimum, and emission lines appear. When the dust is blown away by radiation pressure the photosphere of the star may again be seen. This model, dubbed the Dust Puff Theory, is a good one except that it implies a physical connection between the stellar atmosphere and the location of the dust formation (which is hard to imagine for dust forming at 20 stellar radii). One way to avoid this problem is to say that the dust forms closer to the star and is blown away by radiation pressure. But then one might expect and rightly so, assuming thermodynamic equilibrium, that the region very near the star is too hot to enable the condensation of carbon into dust. Even now, after over two centuries of observation, many aspects of the RCB phenomenon remain mysterious, including the details of the dust formation mechanism, the evolutionary status of RCB stars, and the nature of their emission-line regions. The R Coronae Borealis Stars, by Geoffrey C. Clayton, an Invited Review Paper, Publications of the Astronomical Society of the Pacific, 108, 225-241, 1996 March. "Model for R Coronae Borealis Stars", Barbara A. Whitney, Noam Soker, and Geoffrey C. Clayton, Astronomical Journal, 102, 284-288, 1991 July. Observations of R Coronae Borealis Stars in Decline: Empirical Arguments for Dust Formation near the Stellar Surface, Geoffrey C. Clayton, Barbara A. Whitney, S. Adam Stanford, and John S. Drilling, The Astrophysical Journal, 397, 652-663, 1992 October.